1. In a bowl stir together milk, sugar substitute, and nonfat milk powder until the latter two ingredients are dissolved. Stir in the Red Raspberry puree, lemon juice, and vanilla. 2. Freeze in an ice cream maker according to manufacturer’s directions. 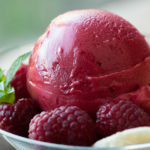 You can make this light ice cream with Strawberry, Blackberry, Black Currant, Apricot, White Peach, Mango, Papaya, or Banana.